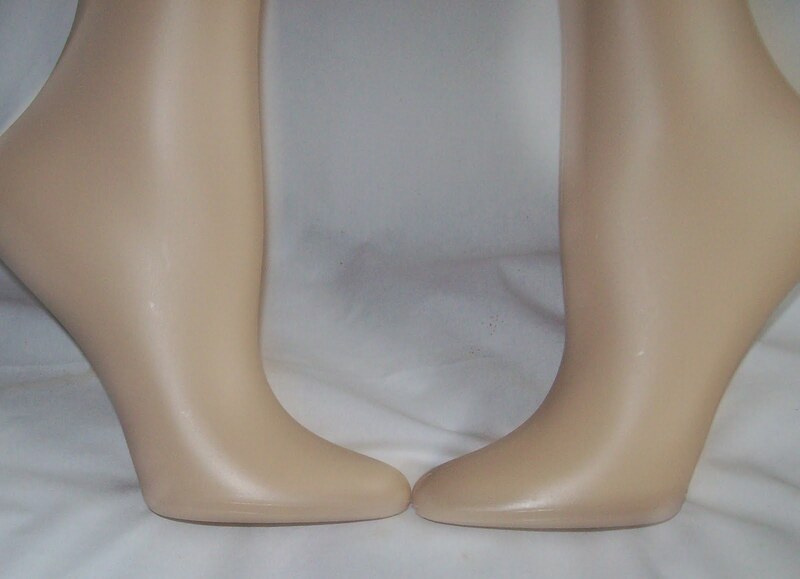 Yesterday, I treated my self to a pair of display (manikin like) legs. I figure if I am going to design, and document, and sell sock patterns, I should invest in the means of making them look their best. 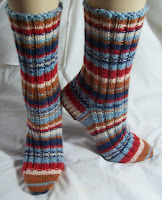 See how much nicer socks look on legs than they do flat, or even on sock blockers? 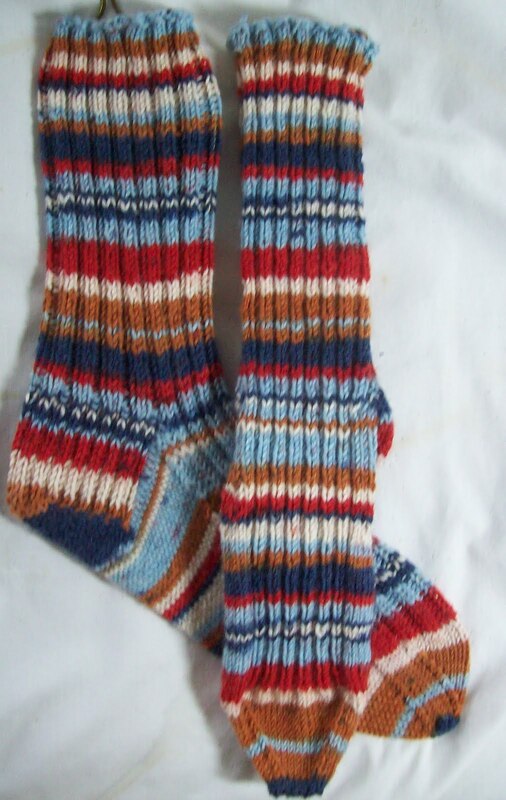 Yes, those are Miss B's Ribbed socks, finished. Lion Brand Magic Stripe Sock yarn, in a simple 2 X 2 ribbed pattern, since Miss B, like all proper children grows and grows, and I want these socks to fit for longer than an blink of eye. Meanwhile—I am on my toes. Today, at work, I will get the Lion Brand Sock Ease Socks started—Color way Cotton Candy (a bright bubble gum/pepto bismal pink). These will be toe up socks, because I don't have a full skein of this yarn (it was gifted to me, and I never look a gift horse in the mouth) nor do I mind when gifted sock yarn is not quite a full skein. 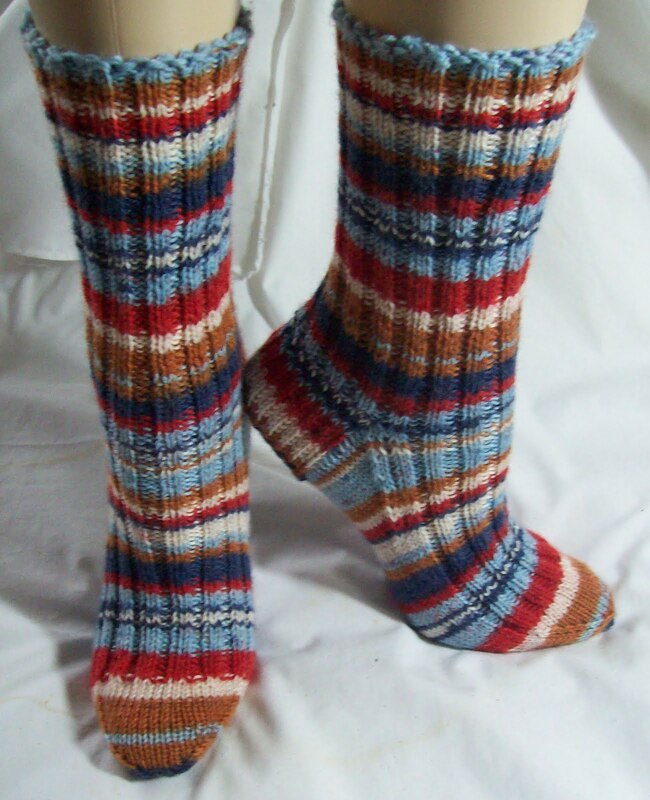 I am sure I have enough (or close to enough) to do a sock of my standard length, (about 9 inches from base of heel to top of sock)--but its easier to work toe up, and not be caught short. Unlike some, who are leg-less after a bit of spirit--I can drink anyone under the table--I have hollow legs. I might go with a simple lace..Pink socks sort of demand lace (or beads, or a ruffle) don't they? The stripe pattern is a dominating one; so a bit of patterning will not be too much. Besides, I done a few pairs (well 2 in a row) of pretty much pattern free knitting—time for a change! I'll go toe to toe with anyone who disagrees! Nice! They definitely do make your fantastic socks come to life. Those legs are great, and Miss B is a great sock. I've been looking for some for the very same reason, but I'm not having any luck. Where did you find your legs? Did you find them when you were out and about? Those are very good things to have around the house. Kicky!